It’s scary facing a cancer diagnosis. It’s disheartening knowing you’ve relapsed. While going through these difficult times, worrying about a place to stay should be the last thing on a parent’s mind. That’s where Ronald McDonald House Charities of Alabama steps in. This is the story of Miley and her guardian, David, two people who have a lot of heart. David is a real-life super hero to Miley. “It’s always me and her,” David said. David took in Miley and her sister Gracie, 13, when they were very young after some family struggles. It’s a perfect example of an extended family member stepping up to make sure two young relatives would grow up happy and safe. He’s also made sure Miley gets the best medical care possible because five years ago, when Miley was about 5-years-old, she was diagnosed with Philadelphia Chromosome positive acute lymphoblastic leukemia (Ph+ALL). It’s a rare subtype of acute lymphoblastic leukemia, which is the most common childhood cancer. When a child has Ph+ALL, the fusion of two genes causes white blood cells to become cancerous. After her diagnosis in 2013, doctors prescribed a study drug to help manage her cancer. Miley went into remission and for a while all seemed well. Then, in October 2015, she relapsed and had to be checked in to Children’s of Alabama. Miley sick with a fever that spiked at 108.8°F and doctors had to put her on a ventilator. David says that on January 19, 2016, he cried for the first time since Miley had been diagnosed with cancer. Doctors warned him that there was nothing else they could do for Miley and family began gathering to say their goodbyes. David says at that point all he could do was pray and leave it all in God’s hands. The next day, Miley’s fever broke and she began to recover! Miley had a bone marrow transplant shortly after. For nearly two years, this spunky girl was doing well and living life. Then, David said she started getting a high fever again. He says that always precedes a relapse. David went to meet with Miley’s doctors and it wasn’t good news. Miley’s platelets had dropped and unfortunately she was in relapse again. This time around, one of Miley’s doctors had a new treatment option. 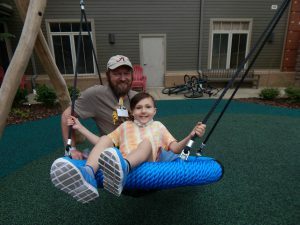 They would try fighting the Ph+ALL with a CAR T-Cell therapy, which the Federal Drug Administration (FDA) approved in August 2017 for treating some types of cancer. Doctors drew blood from Miley, isolated her T-Cells (which are a type of white blood cell) and sent them to a lab in New Hampshire to be genetically modified so they would attack the specific cancerous cells in her body. Miley then received an infusion containing these special T-cells. Right now, Miley and David are waiting for test results to learn if the CAR T-Cell therapy has worked. While they do, they’re able to stay for free at the Birmingham Ronald McDonald House. 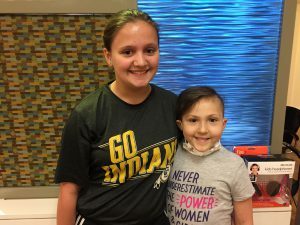 “We were in the hospital for a long time because I had a CAR T-cell infusion and they wanted us to stay close by and we live two hours away from here. So they were gonna put us in an apartment. But there were no apartments open,” Miley says. David says their hospital social worker called the Ronald McDonald House and the charity was able to provide a guest room for the family. 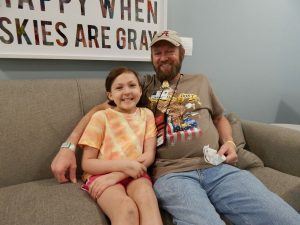 For now, Miley and David are sticking close to Children’s of Alabama. “The doctors are waiting to see if it’s working or not,” Miley says. Miley has to see the doctors at clinic three times a week. Miley says she “would feel very tired if we had to drive back and forth” from Birmingham to Oxford though David swears that Miley usually falls asleep! David says Miley’s doctors also like that they’re nearby. “I know they’re more comfortable with her being right here. When she had her bone marrow transplant, we were staying off Highway 280. Which, that isn’t far but it’s 20-25 minutes depending on traffic. I think they like it a lot better with us being just a couple minutes’ walk from the hospital in case something did happen,” David said. Because the Ph+ALL and CAR T-Cell theraphy have lowered her immune system, Miley mostly stays in the family’s guest room. Her days are broken up by walks with David and her sister Gracie has been able to visit. “It’s fun. Sometimes we play games and watch TV,” Miley says. We ask if Gracie would drive Miley around in a few years once she gets her license. Miley’s spunky attitude comes out. “I would never ride with her! I don’t think she’s gonna know how to drive. I’ll never be on the roads when she is,” Miley says. “She’s not that bad,” David replied. “She can’t even drive a lawn mower,” Miley points out. “OK, well you’ve got me there,” David says. 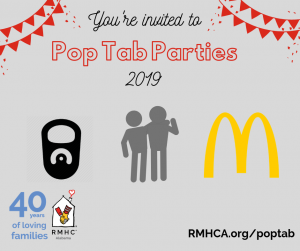 And it’s a good thing the Ronald McDonald House is close to a lot of restaurants. “Miley’s a picky eater, so I usually go out and bring something to her,” David said. Miley says her favorite thing to eat for dinner is a cheeseburger with pickles and mayo and she dips her fries in ranch. “I don’t like ketchup or onions,” she declares. She and David both agree that the House is homey enough to get some rest. “It’s a lot nicer sleeping accommodations. The bed’s a lot better than being in the hospital on the couch,” David says. “Or on the floor!” Miley exclaims. “Or on the floor. Because I did fall off the couch one morning. She was laughing, she thought it was funny!” David says. There’s another benefit to staying at the Ronald McDonald House that not everyone gets to see but David appreciates. “Staff’s awesome, everybody’s nice, it’s an awesome place. They do so much for everybody to help people. Because everybody I’ve met, it’s just family. You don’t realize how much people become family ’til you have to go through something like this. People say, ‘But you just met them.’ But when you see them every day, they become family,” David says. RMHCA is so grateful for the many supporters who help our mission. Please consider giving financially or volunteering today so we can continue helping families like Miley and David’s feel comfortable and cared for when they have to be so far from home. We are so happy to share that the CAR-T Cell therapy is working for Miley! David tells us that her doctors are pleased with her progress and believe she is in remission! The family stay at the Ronald McDonald House for the near future because Miley’s doctors want continue monitoring her reaction to the therapy.